2 x 350g bags of instant royal icing . First make the almond paste. Sieve the ground almonds and icing sugar together. Add the caster sugar and mix well. In a separate bowl whisk the egg and brandy together with a fork and add two thirds of this liquid to the dry ingredients and bind them together. Do not add all of the liquid at the start as you may or may not need it all, depending upon the size of your egg. Add the remaining liquid only if it is needed to bind the mixture together. The almond paste should look like a ball of pastry after it has been kneaded together. Wrap in cling film and store in the fridge until required. Preheat an oven to 150 degrees/gas 2. Butter and line a deep eight-inch/20cm round cake tin. Beat the butter and sugar in a bowl until light and creamy. Pour in the eggs and orange juice and beat well. Mix in the flour one third at a time. Fold in the ground almonds and orange rind until evenly mixed. Spoon half the mixture into the prepared tin. Roll out the almond paste to a 7½ inch/19cm circle. Lay this on top of the cake mixture in the tin, and then cover with the rest of the mixture. 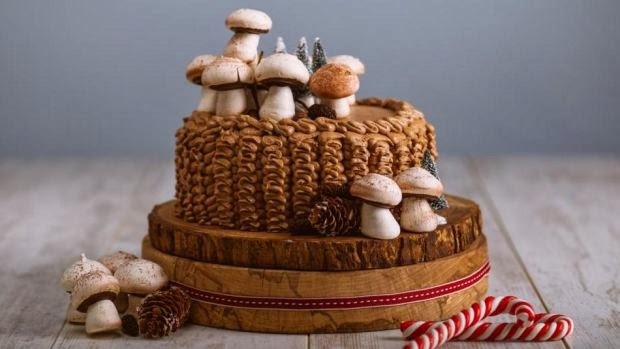 Bake for 1 hour, or until a skewer inserted into the centre of the cake comes out clean; the skewer may be slightly sticky from the marzipan in the centre. Cover with foil after one hour. Leave to cool in the tin for 20 minutes and then turn the cake out onto a wire rack to cool completely. To ice the cake, I used royal icing made by CPAC in Foxford, Co Mayo, as it has the whitest colour - some instant royal icings can have a bluish tinge. I used dried oranges to decorate. I find that mandarin oranges have the brightest colour. To dry the oranges, slice them thinly and lay them on a baking tray lined with parchment paper. Dredge them with icing sugar and dry out in the oven at 100 degrees/gas ¼ for three hours. These also make gorgeous Christmas tree decorations. I took my deep fat fryer out of hibernation for these sugar coated beauties. 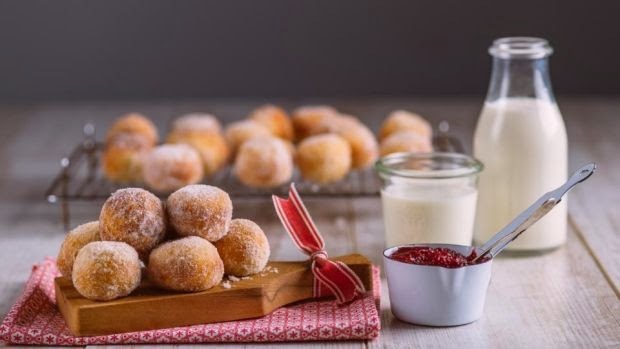 I tried to make them using a saucepan filled with hot oil but found it hard to control the temperature of the oil, causing the doughnuts to burn before they were cooked – so it's definitely a job for the plug-in fryer. Put the flour, sugar, salt and dried yeast in a large mixing bowl and stir until combined. Melt the butter in a saucepan over a gentle heat. Add the milk and gently warm the milk until tepid, then mix in the yolk. Stir this into the dry ingredients. Roll into a ball then knead on a floured board for five minutes, until springy. Put it back in the bowl, cover with a clean tea towel and leave it in a warm place for an hour or so. The dough will almost double in size. Knock back the dough and break it into 25g balls. Place on a baking tray and allow to prove for another 30 minutes, covered with a clean tea towel. Meanwhile heat the oil in the deep fat fryer to 180 degrees Celsius. Gently lower the dough balls one at a time into the hot oil, in batches of two or three, and fry for three to five minutes, or until golden-brown, and then carefully turn over. Remove from the hot oil with a slotted spoon and drain on kitchen paper. Scatter a thick layer of caster sugar onto a baking sheet. Sprinkle over a large pinch of cinnamon and mix. As you take each one from the oil, roll it in the sugar to coat These can be made a few hours in advance, and reheated in a low oven for 10 minutes. Serve warm with cranberry sauce. To make the cranberry sauce, place the cranberries, sugar, ginger, orange juice and water in a medium saucepan. Cook over a gentle heat and let the mixture come to the simmer until the cranberries start to burst. Let the sauce simmer for 10 minutes, stirring often to prevent cranberries from sticking to the bottom of the pan. Remove from the heat and process in a blender until smooth. Using a spatula, push the blended sauce a little at a time through a fine mesh strainer set over a medium bowl. Discard the contents of the strainer. Cover the sauce and refrigerate until needed. If it thickens too much, you can thin it out with a little water. You will need a 24-hole mini muffin tray. To make the pastry, place the flour, butter and salt into a large, clean bowl. Rub the butter into the flour with your fingertips until the mixture resembles fine breadcrumbs, working as quickly as possible to prevent the dough becoming warm. Add the water to the mixture and, using a cold knife, stir until the dough binds together. Add more cold water, a teaspoon at a time, if the mixture is too dry. Wrap the dough in cling film and chill it for a minimum of 15 minutes and up to 30 minutes. Remove the pastry from the fridge. Place on a lightly floured surface and, with a floured rolling pin, roll out to the thickness required – about the thickness of a €1 coin. Using a pastry cutter slightly larger than the holes on your muffin tray, cut out 24 circles and line each muffin hole. For the almond paste, mix all the ingredient together until you get a smooth paste. 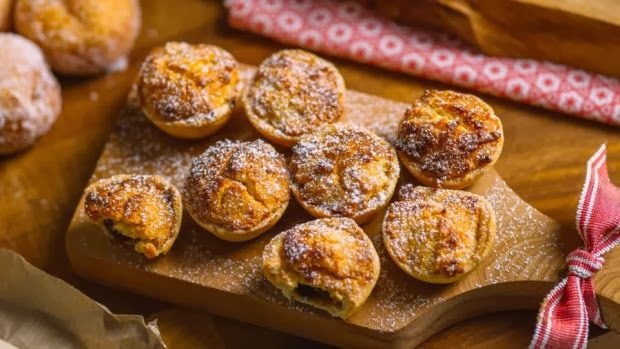 To assemble, spoon a scant teaspoon of mincemeat into each of the lined muffin holes and cover with the almond topping. Pre-heat an oven to 160 degrees/gas 3 and bake for 15 minutes until golden brown. Allow to cool slightly in the tin and remove. Dust with icing sugar and serve. The little tartlets can be prepared in advance and kept in the fridge or freezer until needed. They can be cooked from frozen. The success of this dessert relies on the quality of the lemon curd, after that it is a simple assembly job. You can buy or make meringues. I use an assortment of little glasses and pots to serve this wonderful tangy dessert in, giving guests a teaspoon to tuck in. On a very low heat melt the butter, add the sugar, lemon rind, lemon juice and sugar and stir in the well-beaten eggs. Contrary to most recipes where lemon curd is stirred using a wooden spoon, I prefer to use a whisk as I feel it add lightness to the curd. Stir with a whisk from time to time until the butter has completely melted. Let the curd cook, stirring regularly, for about 10 minutes, until it is thick and custard-like. It should feel heavy on the whisk. Remove from the heat and stir occasionally as it cools. Pour into spotlessly clean jars and seal. It will keep for a couple of weeks in the fridge. 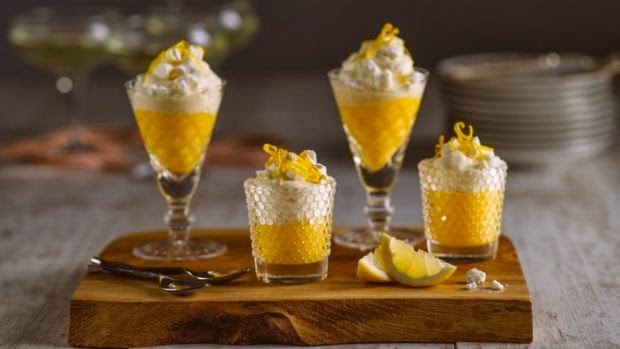 To assemble, spoon the curd until the glasses you are using are one-third full, cover the curd with a dollop of lightly whipped cream and sprinkle generously with crushed meringues. Another take on these ingredients is to mix together the whipped cream, lemon curd and crushed meringues . Line a 2lb pudding bowl with a double layer of cling film and fill the lined pudding bowl with the mix. Wrap in cling film and freeze overnight, or until needed. Remove from the freezer 30 minutes before required, and turn out on a serving plate. If you have lemon curd left over, pour some on top and serve. This will serve six. If you have some curd left over, it will keep in the fridge in a covered jar for two to three weeks. 250g Digestive biscuits, broken up into small pieces. 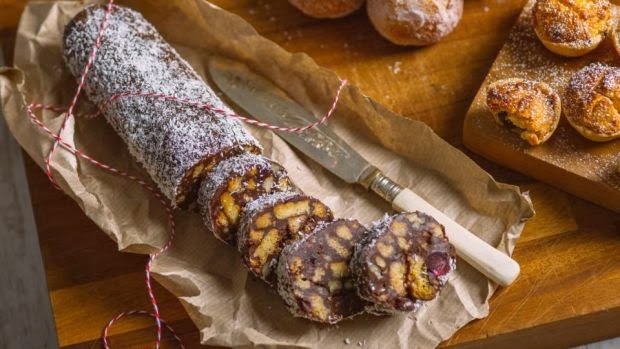 I was first introduced to chocolate salami by a Portuguese work colleague in London. It arrived in a Christmas parcel from her mother, beautifully wrapped in cellophane with string tied around it to replicate its meaty counterpart. I have adapted my biscuit cake recipe to make three chocolate salamis. 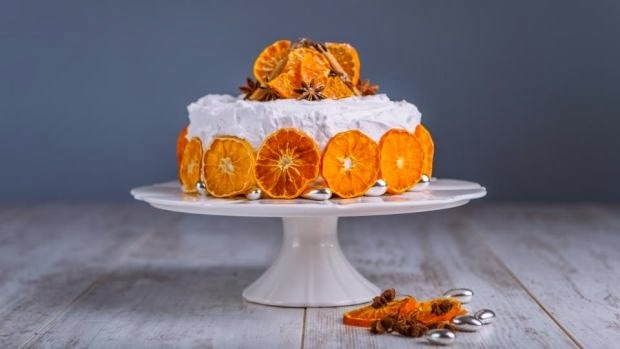 There is plenty of room for personal expression when making this, ingredients can be chopped and changed depending on what’s in the cupboard, just keep the first four ingredients the same as in the recipe. Chocolate salami is very impressive on a dessert platter or as a petit four served with coffee. It will also keep for weeks in the fridge or a cool place, well hidden, and it freezes beautifully. Be warned – it has that addictive quality which makes it virtually impossible stop nibbling it. Place the chocolate, butter and Golden Syrup in a large bowl set over a saucepan of simmering water and allow to melt, helping it along the way with an occasional stir. When melted, remove from the heat and beat in the egg, add the walnuts, sultanas, cherries, and broken biscuits and stir until all ingredients are combined. Put a large double layer of cling film on a clean work surface that has been wiped with a damp cloth (this will help the film to stick). Spoon one third of the chocolate mix into the centre of the film – you need a rough sausage shape about 25cm long. Wrap the sausage in the cling film, pushing against the work surface to make it quite tight. Once completely covered, hold the ends of the cling film and roll the salami as if it were a rolling pin, to help tighten the wrap. Tie the ends into a knot, then chill for at least eight hours, preferably overnight. Repeat this for each salami. To serve, unwrap the salami and roll it in desiccated coconut, then slice using a hot knife. Having written thus far about chocolatey, creamy and sugary treats, the Mammy is breaking out in me and I feel morally obliged to mention a fresh fruit offering. I am a very visual cook, so while taste, seasonality and flavour are all paramount, the overall look of a dish is also important to me – we eat with our eyes. 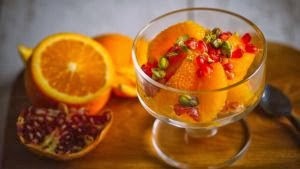 So that brings me to brilliantly coloured oranges and the jewels that are pomegranate seeds. At this time of year, I use pomegranate seeds constantly. They add sparkle to the simplest of salads. To segment the oranges, use a sharp knife and start at the top and slice downwards, following the curve of the fruit. Try to cut away all of the skin and the pith without taking too much of the fruit. I usually err on the side of caution and then go back afterwards to trim up spots that I missed. Slip the knife between one of the segments and the connective membrane. Cut until you reach the middle of the orange, but don't cut through any of the membrane. Go slowly and keep your fingers out of the way. Use a scooping motion to turn the knife back on itself, hook under the bottom edge of the segment, and pry it away. The side that is still attached to a membrane will peel away, leaving you with a perfect wedge. Repeat with all the other segments. The first segment is always the hardest to get out and the rest are a lot easier. Preparing a pomegranate doesn't have to be a sticky, messy job – but do wear an apron and if you are fussy about your hands being stained use latex gloves – as the juice will stain. Insert a paring knife into the top of the pomegranate, angling toward the middle. Cut a cone-shaped piece and gently pry it out. Then, cut a thin slice from the bottom of the pomegranate. Score the ridges – looking down at the pomegranate, you'll see ridges radiating out from the top. Run your paring knife along those ridges, scoring the skin and barely cutting into the pith. Break the pomegranate into segments. Hold the pomegranate in both hands with your thumbs on the cone-shaped indention on top. Gently tear the two halves apart. They should split evenly along the score-marks. Continue tearing the pomegranate along the score marks into individual segments. Release the seeds into a bowl of water. Working one segment at a time, submerge a segment into the water and gently pry away the seeds with your fingertips. The seeds will sink to the bottom while bits of the membrane will float to the top. Repeat with all your segments. I find this whole process very therapeutic. Strain the seeds. Use or store the seeds. To assemble your salad, sprinkle some pomegranate seeds on the orange segments. Depending on the sweetness of the oranges, I sometimes drizzle a little honey over the fruit, then to add an extra dimension in terms of colour and texture I sprinkle some chopped shelled pistachio nuts on top.